Get ready to discover the very best of Tropical North Queensland on the Great Tropical Drive. Some 26 different routes make up the drive, _ Experience bustling cities on the coast, laid-back holiday towns and tiny bush outposts, and some of the region’s most spectacular natural landforms. There’s a lot of ground to cover in these 12 days (more than 2,000km in fact), so what are you waiting for? This legendary loop starts – and ends – in Cairns. Start your morning with a swim at the Esplanade Lagoon and tuck into a juicy fresh mango straight from the markets. Then it’s time to point the car north and head out of Cairns on the Captain Cook Highway. The drive today is only short, but it’s along what might just be the most beautiful stretch of road in the country. The highway hugs the coast, threading between rainforest and beach with just metres between you and the sparkling blue sea. If you fancy a close encounter with one of the oldest reptiles on earth, drop into Hartley’s Crocodile Adventures, just off the highway about 40 minutes north of Cairns. Take a quick detour off the highway and grab a coffee in the beachside enclave of Palm Cove, a tiny but glamorous sliver of civilisation set right on the sand. If you’re there around lunchtime, try the stunning tropical flavours at award-winning modern Australian eatery Nu Nu or drive further north to Thala Beach Nature Reserve and have lunch with a side of stunning views at Osprey’s Restaurant. Your ultimate destination today is Port Douglas, a stylish village of swaying palm trees and glitzy resorts. Take a dip at Four Mile Beach, a gorgeous stretch of golden sand that’s always blissfully uncrowded, then explore the high-end boutiques and buzzing restaurants of Macrossan Street. Spend the night at Tropical North Queensland’s original luxe resort, the Sheraton Grand Mirage. Developed by notorious businessman Christopher Skase, the hotel put Port Douglas on the map when it opened in 1988, and remains one of the region’s stand-out resorts. Today you’ll journey into the heart of the mighty Daintree, the oldest tropical rainforest on earth. There are more than 1,200sq km of emerald green forest, rugged mountains, winding rivers and tumbling waterfalls to be discovered. Start at Mossman Gorge, on the southern edge of Daintree National Park, with a walk, hike or swim in the crystal clear waters. This region is the ancient home of the Kuku Yalanji people, so don’t miss the chance to take a tour with a traditional owner and learn about their fascinating way of life. Continue north through the rainforest to the Daintree River, where saltwater crocodiles cruise slowly through the mangroves. Cross the river on the car ferry bound for Cape Tribulation, a remote peninsula where the rainforest meets the reef. This is the end of the sealed road, but four-wheel drivers can continue on to Cooktown along the Bloomfield Track. Cars and campers will need to retrace their route and pick up the highway to skirt the edge of the park and reach tonight’s destination. Captain Cook spent seven weeks repairing the Endeavour in Cooktown in 1770 and the little town is proud of its illustrious heritage – just ask any of the locals to fill you in over a beer. There are patches of sealed road north of Cooktown as you travel further into Cape York, but not many. So, unless you’re a seasoned driver behind the wheel of a four-wheel drive, it’s time to head south again, on the Mulligan Highway. The route to Mareeba passes Black Mountain (Kalkajaka) National Park, a place of myth and legend where stories abound of people and cattle going missing in mysterious circumstances. Stop at the Lakeland Roadhouse in the tiny town of the same name for a decent coffee. 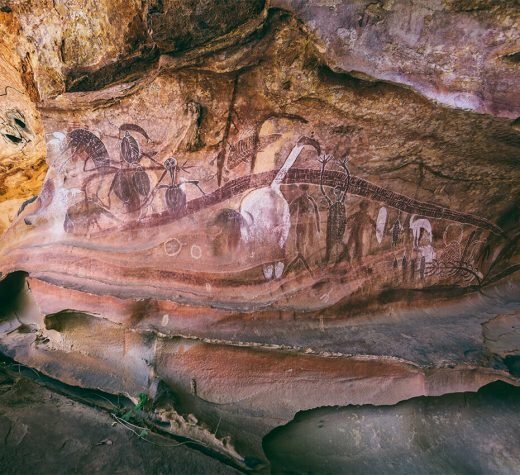 Your next stop is Laura, home to the world’s largest collection of prehistoric rock art, and now accessible year-round thanks to a fully sealed road. Drop in to the Quinkan & Regional Cultural Centre, a kind of one-stop-shop where you can organise a tour of the rock art, learn about local history and browse Aboriginal arts and crafts. The road then winds its way up into the tropical tablelands, known for their cool temperatures, orchards, delicious fresh produce and quirky villages. You’re on your way to the town of Mareeba, a renowned coffee hot-spot. The area is also incredibly rich in birdlife, so visit the Mareeba Wetlands at twilight in search of brolgas and sarus cranes. This morning, forgo your standard shower for what locals call a Tropical North Queensland shower – a swim under the cool cascades of Emerald Creek Falls, just outside of town. Head south on the Kennedy Highway and you’ll hit Atherton, the hub of the Atherton Tablelands. Browse the great collection of art at the Tableland Regional Gallery, take a peek at the art deco Barron Valley Hotel and explore The Crystal Caves, one man’s huge collection of crystals and fossils. Just outside of town is the deserted settlement of Hou Wang, founded by Chinese settlers during the 1870s gold rush, and home to the last remaining timber and iron temple in the country. Or head 10 minutes out of town to the Tolga Bat Hospital’s Visitor Centre, where you’ll meet some of the residents, including flying foxes, microbats and bats (tour bookings essential). About 25km out of Atherton on the road to Ravenshoe is Mount Hypipamee National Park, home to a striking volcanic formation known as a diatreme – think a deep crater – some 70m across with sheer granite walls. The road continues to climb upwards towards Ravenshoe, the highest town in Queensland. The active might want to tackle the nearby Koolmoon Creek trail, part of the larger Misty Mountains wilderness tracks, which starts at picturesque Little Millstream Falls. Not so active? Take in the views of Tully Falls from the Tully Gorge lookout, about 30mins drive from town. Say farewell to the cool green tablelands, put your sunglasses on and head for the bush. Stop for a soak in the Innot Hot Springs, where the naturally heated waters of Nettle Creek are renowned for their healing and rejuvenating properties. The road travels through Forty Mile Scrub National Park, home to one of the few remaining pockets of inland dry rainforest in Queensland. Break your journey with a short self-guided walk: the 300m track features signs with information about local flora and fauna, including the world’s largest cockroach species. Just beyond the park is one of Australia’s great geographical wonders, the Undara Lava Tubes. Take a tour through incredible underground caves formed around 190,000 years ago by an ancient volcanic flow. Book one of the daily tours, led by a Savannah Guide (they’re known as “Outback Interpreters”), at Undara Experience. Choose a good playlist for today’s drive – it’s the longest of the trip, covering almost 400km of flat desert plains and rolling red dirt. Stop for a drink in Australia’s smallest bar at The Lynd Oasis Roadhouse; it’s just 1.2m long, with room for two bar stools. Don’t worry if the bar seems crowded, there’s plenty of room in the beer garden outside. Your overnight stop is the charming town of Charters Towers, founded during a gold rush in the late 1800s. The streets are lined with magnificent heritage buildings and colonial architecture, including the one of Australia’s first stock exchanges, a theatre, post office and city hall. Catch a movie under the stars at the Tors Drive-In, one of the oldest drive-in theatres in Queensland – it’s been operating since 1966. Sleep in a piece of history at the Royal Private Hotel, built in 1888 and known as the First Lady of Charters Towers. Set in the centre of town, the heritage-style rooms have been updated and there’s an option for every budget. If you want to splurge, stay in the Honeymoon Suite, complete with four-poster bed and French doors. It’s time to head back to the coast. The Flinders Highway runs north-east from Charters Towers towards Townsville, the largest city in Tropical North Queensland. On the way, stop at Bowling Green Bay National Park. You’re spoilt for choice with bushwalking trails here, with paths ranging from a wheelchair-accessible boardwalk to challenging treks that will take most of the day. It’s a fantastic spot for bird-watching, too, with the likes of scarlet honeyeaters and channel-billed cuckoos. Once you’re in Townsville, visit the excellent Museum of Tropical Queensland, stroll along the picturesque esplanade, admire the 19th-century buildings and climb Castle Hill to take in the view. There’s (almost) a pub on every corner, which is bound to endear you to a place. Hop on the ferry to Magnetic Island, about 20 minutes offshore. Sitting right on the Great Barrier Reef, the island is almost 70 per cent national park, with 23 sparkling bays and beaches dotted around the shore. You’re past the halfway point of your Tropical North Queensland adventure and you’re about to enter the lush corridor known as the Great Green Way. End to end, it runs just under 400km and is packed full of natural wonders – 12 national parks, two World Heritage areas and 25 islands. With only 100km or so to travel today, you can take your time and make the day your own. Maybe hike through the Paluma Range National Park, swim under a 1930s stone bridge in the clear waters of Crystal Creek or soak up some signature Queensland sun on the golden sands of Balgal Beach. Ingham is a little piece of the Mediterranean on the Queensland coast. It’s often referred to as Little Italy, thanks to the long history of Italian migrants who have left their stamp on the town. Trace its history, and connection to sugar cane, at the 50m-long Mercer Lane Mosaic, or via the Hinchinbrook Heritage Walk. You’ve seen a lot of waterfalls by now, but you won’t want to miss this one. Take a quick drive inland to see Wallaman Falls, the highest permanent single-drop waterfall in the country, plunging 268m through rainbow-coloured mist into the river below. Get to Cardwell early so you can jump on a ferry to Hinchinbrook Island. It’s something of a wonderland, from its mysterious cloud-covered mountains to its mangrove-lined estuaries, rocky headlands and hidden beaches. If you’ve got time and want to break your road trip, trek the Thorsborne Trail, a 32km, four-day journey considered one of the world’s greatest wilderness walks. If you’ve got less time, take a day-trip to Zoe Bay to Zoe Falls on the island’s south-east coast and discover the deliciously cool freshwater pool at the base of nearby Zoe Falls. Cardwell is the oldest town in Tropical North Queensland, dating back to 1864. Check out the Visitor and Heritage Centre located in the old bush telegraph station, one of the oldest buildings in North Queensland. If you’re in town on a Thursday, join the free heritage Pioneer Tour, hosted by enthusiastic local volunteers. One of Queensland’s social media stars is just outside of Cardwell, the impossibly blue Cardwell Spa Pool. The pool became an instant Instagram hit in 2016 thanks to its water, which ranges from a bright baby blue to a deeper milky blue, depending on the time of day. Have a swim, strike a pose and inspire widespread FOMO. Continuing on the water theme, today’s drive passes through the town of Tully, one of the wettest towns in Australia. There’s even a giant Golden Gumboot in town to prove it. All that rain makes for really good rapids on the Tully River, so sign up for a white-water rafting adventure. Turn back towards the coast and make your way to the dreamy seaside village of Mission Beach, spread along 14km of palm-fringed beach, and the closest mainland point to the Great Barrier Reef, which is just 40km offshore. There are myriad attractions here … take the Cutten Brothers Walking Track to see where rainforest meets reef; hire a mountain bike and explore local trails or a SUP to float through turquoise waters (both from Mission Beach Bike Hire); do a little shopping along Porter Promenade; and find somewhere fabulous to eat. For breakfast today, grab some fresh-from-the-tree fruit at one of the many roadside honesty stalls dotted around the area or at the famous Mission Beach Markets (first and third Sunday of the month). Top that off with a swim at one of the many secluded beaches which run along the length of the town. Then it’s time to head north, and you’ll want to detour off the Bruce Highway to visit Tropical North Queensland’s only fairytale castle in the rainforest. Paronella Park was the dream of Spanish immigrant José Paronella, who, in the 1930s, set about creating a “pleasure garden” that featured a castle and other stone buildings, exotic gardens (with some 7,500 tropical trees and plants) and winding paths, set against a delightful waterfall. You’re bound for Innisfail, the largest town on the Cassowary Coast and the art deco capital of Australia. Speaking of cassowaries, drive out of town for about 15 minutes to Etty Bay, where the oversized bird (the largest flightless species in the country) can be found wandering the soft white sand, often with chicks in tow. The nearby Etty Bay Caravan Park is a good option for an overnight stay, with campsites and cabins. Your Great Tropical Drive is almost over! There’s only 90km left on this epic road trip as you make your way back towards where it all began, Cairns. There’s time for one more swim in a pristine rainforest creek at Babinda Boulders, sitting in the shadow of Queensland’s highest mountain, Bartle Frere. The waters stay deliciously cool no matter how high the temperature and it’s a favourite swimming spot for locals all year round. When you get to Cairns, catch the afternoon ferry to Fitzroy Island, 45 minutes offshore. Trails wind up mountains to stunning lookouts, native orchids bloom among rainforest and turtles cruise gently around fringing reefs. Hike, swim, snorkel, dive, kayak or cruise in this tropical paradise. Finish your road trip in style with a night (or more) at the Fitzroy Island Resort, the only property on the island. There’s a swim-up bar, poolside foot massage service and an endless array of rainbow-coloured cocktails. You’ve earned all of it. Or, if you want to stay on land, head 30 minutes north to the glamorous coastal resort of Palm Cove, where you can relax under a palm tree or indulge in one of the five world-class spas. Discover what more there is to do around Cairns.